There is one good thing about this scorching summer in our country, the mangoes. We go mad over mangoes. 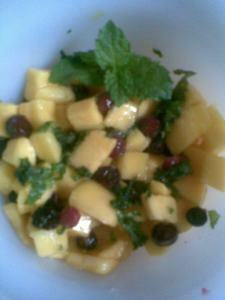 I belong to the land of mangoes and made a lot of mango recipes recently. All of them are sure coming here, one of them is already on the banaras blog. The sinful one, the kind of dessert you have to force yourself to control portion size. Aam malai that is. 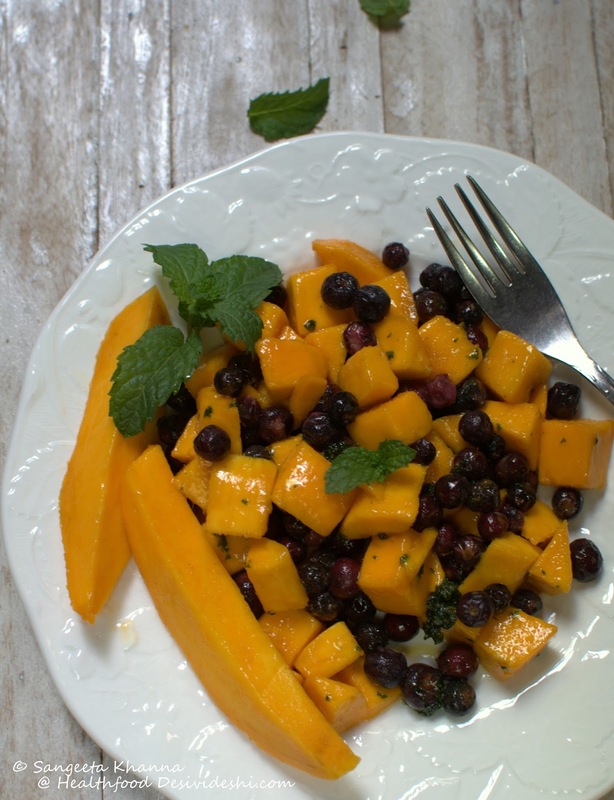 Combining Mangoes with Phalsa (Grewia asiatica) a berry native to India and Pakistan feel just right for the season, both these come together in the season. This salad has been a regular every summer for quite a long time. Surely qualifies to be exotic and it is totally my creation, I had experimented once when the mangoes were way too tart and were taking up a lot of sugar to make a mango shake so I decided to make this colorful exotic wonder. Yes it is a wonder believe me. This is the picture taken in 2009 with a cell phone camera. Not a smartphone back then. some phalsa berrys about 2-3 tbsp (any tart colorful berry will be fine but phalsa is in season here and it gives a crunch owing to its seeds) made phalsa sherbat too. 1 tbsp of sugar and 1 tsp of kala namak is required too. Sprinkle 1/2 tbsp sugar on phalsa and 1/2 tbsp on the roughly chopped mint leaves separately and keep aside till you chop the mango in cubes. Now macerate the phalsa and mint separately to release the juices, doing it separately is important as you don't want the colored juices to mix up before dressing the salad. Also macerate the phalsa with the back of a spoon, just to crush it a bit but the mint has to be crushed into a mortar and pestle preferably, making it almost like a green sauce. This is a long description of a simple salad but follow to make this delicious salad just the way I do. Now mix the ingredients as you like, more sugar can be used if the mangoes are tart, mix lightly, not crushing the mango cubes, just letting them soak up the flavors. See the picture for clue. Sprinkle black salt, chill and serve. Or eat right away. The burst of flavors when mint hits your nose and the phalsa crushes under you molars is out of this world. The sweet n sour taste is a winner. And why I say it is fit for a dessert is that once you eat this you don't want to spoil the taste in your mouth, secondly it is a good mouth freshener. Believe me the mint is so refreshing after maceration that it takes the salad to another level. Pomegranate seeds also taste good with it, I have made this salad with cherries too, but phalsa is simply exotic. Try it with phalsa first and then move on to anything else. A dish which serves 2 purposes oh wow lovely idea and a unique dish!!! sakshi you are always welcome sweetie......many more will be there for you . Very nice,simple and refreshing recipe.. I love mangoes. I'm going to have to try this. What a wonderful salad-just right for the hot summer days!! Very unique and inviting salad ! 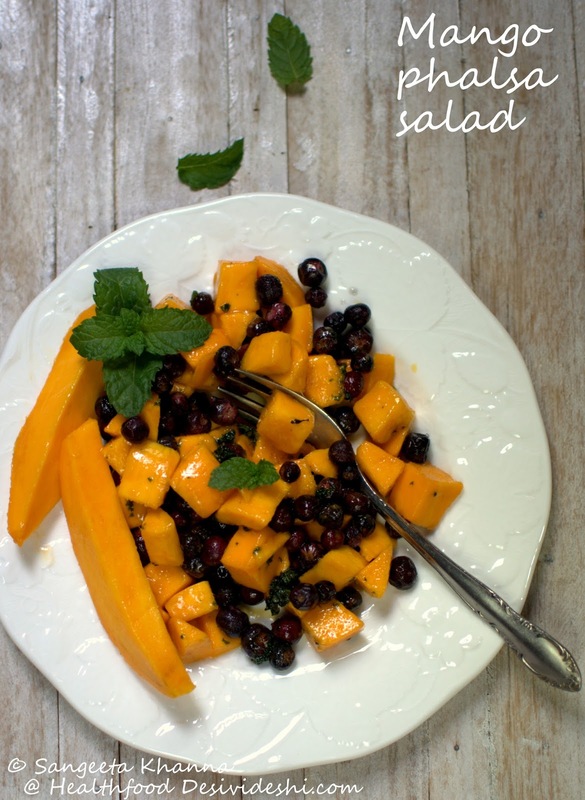 The mango salad sounds excellent and very refreshing! Mango is my favorite fruit in the world, even though in the South Italy we can only find imported mangoes! I will certainly try this recipe. The combination with the mint sounds fantastic! thanks 5 star foodie and stile mediterraneo for your generous comments.